Promotional Blues Brothers Classic Sunglasses will be a great promotional gift to make young customers happy. These custom classic sunglasses have features such as flexible plastic frame and temples, along with smoke lens. 100% UV protection gives the customers the best comfort in bright sunny days. Place your brand logo in the 1-1/2" W x 1/4" H space provided in the temple. Clothing brands, music stores and hair salons can make use of these custom sunglasses for their promotions. Order now to get free artwork design and free online proofs! 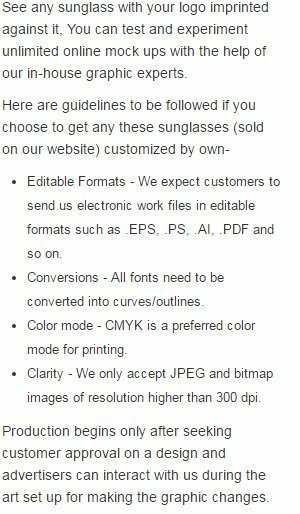 Request a quote to know what you can save on ordering Promotional Blues Brothers Classic Sunglasses. Available Colors: Frame: Black; Temples: Blue, Green, Orange, Pink, Yellow; Lens: Smoke.